IdM supports the logging in using user principal names (UPN). A UPN is an alternative to the user name to authenticate with, and has the format username@KERBEROS-REALM. In an Active Directory forest it is possible to configure additional UPN suffixes. These enterprise principal names are used to provide alternative logins to the default UPN. For example, if a company uses the Kerberos realm AD.EXAMPLE.COM, the default UPN for a user is user@ad.example.com. However often a company want instead their users to be able to log in using their email addresses, like user@example.com. In this case the administrator adds an additional UPN suffix example.com to the Active Directory forest and sets the new suffix in the user's account properties. The UPN suffixes for a domain are stored in the multi-value attribute ipaNTAdditionalSuffixes in the cn=trusted_domain_name,cn=ad,cn=trusts,dc=idm,dc=example,dc=com subtree. In some environments with trusts between IdM and Active Directory, you can configure users to access an IdM client using a host name from the Active Directory DNS domain, while the client itself is joined to IdM to benefit from its Linux-focused features. This is not a recommended configuration and has some limitations. Red Hat recommends to always deploy IdM clients in a DNS zone different from the ones owned by Active Directory and access IdM clients through their IdM host names. This option disables the SRV record auto-detection for the Active Directory DNS domain. Replacing the default mapping prevents Kerberos from sending its requests for the Active Directory domain to the IdM Kerberos Distribution Center (KDC). Instead Kerberos uses auto-discovery through SRV DNS records to locate the KDC. Only for the added host idm-client.ad.example.com the IdM KDC is set. Authenticating to resources on clients that are not within an IdM-owned DNS zone is only possible by using user name and password. SSL-based services require a certificate with dNSName extension records that cover all system host names, because both original (A/AAAA) and CNAME records must be in the certificate. Currently, IdM only issues certificates to host objects in the IdM database. The certmonger service uses the default host key stored in the /etc/krb5.keytab file to authenticate to the IdM Certificate Authority (CA). If you require Kerberos single sign-on to access resources on the IdM client, the client must be within the IdM DNS domain, for example idm-client.idm.example.com. You must create a CNAME record idm-client.ad.example.com in the Active Directory DNS domain pointing to the A/AAAA record of the IdM client. Use the --force option, because the host name is a CNAME and not an A/AAAA record. User groups are required to set access permissions, host-based access control, sudo rules, and other controls on IdM users. These groups are what grant access to IdM domain resources, as well as restricting access. Both AD users and AD groups can be added directly to IdM user groups. To do that, first add the AD users or groups to a non-POSIX IdM external group and then to a local IdM POSIX group. The POSIX group can then be used for user and role management of the AD users. The principles of handling non-POSIX groups in IdM are described in Section 5.1.3.2, “Active Directory Users and Identity Management Groups”. It is also possible to add AD user groups as members to IdM external groups. This might make it easier to define policies for Windows users, by keeping the user and group management within the single AD realm. Optional. Create or select the group in the AD domain to use to manage AD users in the IdM realm. Multiple groups can be used and added to different groups on the IdM side. The external group must be linked to a additional group of a user and not to the user's primary group. Active Directory stores group members in member attributes of a group, and IdM uses this attribute to resolve the members. However, Active Directory stores the primary group of users in the primaryGroupID attribute in the user's entry, which is not resolved. Add the AD users or groups to the IdM external group as an external member. The AD member is identified by its fully-qualified name, such as DOMAIN\group_name or DOMAIN\username. The AD identity is then mapped to the Active Directory SID for the user or group. [root@ipaserver ~]# ipa group-add-member ad_users_external --external "AD\Domain Users"
Trust management involves several areas, such as global trust configuration, Kerberos trust configuration, DNS realm configuration, or ID ranges assignment to Active Directory users. The ipa-adtrust-install utility automatically automatically configures background information for the IdM domain which is required to create a trust with the Active Directory domain. The trust configuration is stored in the cn=domain,cn=ad,cn=etc,dc=example,dc=com subtree. Changing the NetBIOS name in most cases requires to re-establish all existing trusts. Therefore, Red Hat recommends not to change the attribute. When Identity Management is configured to trust an Active Directory forest, an MS-PAC record is added to the Kerberos tickets of IdM users. An MS-PAC record contains security identifiers (SIDs) of the groups to which an IdM user belongs. If the primary group of the IdM user has no SID assigned, the value of the security identifier defined for the Default SMB Group will be used. The same logic is applied by the Samba suite when the AD domain controller requests user information from the IdM trust controller. 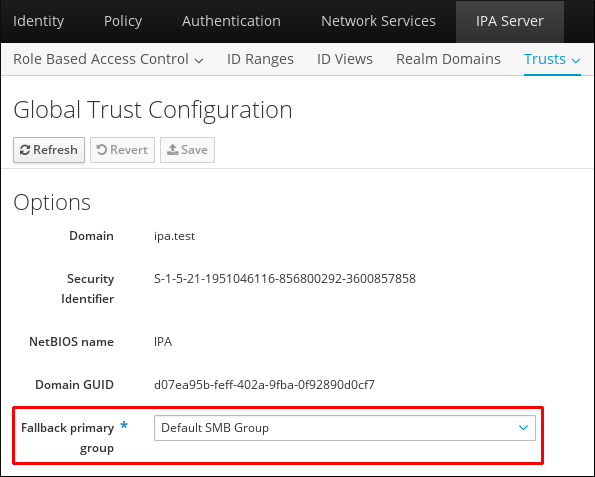 The Default SMB Group is a fallback group created automatically by the ipa-adtrust-install utility. The default group cannot be deleted, but you can use the global trust configuration to specify another IdM group to be used as a fallback for the primary group of the IdM users. [root@server ~]# ipa trustconfig-mod --fallback-primary-group="Example Windows Group"
Open the IdM web UI. Under the IPA Server main tab, select the Trusts subtab, and then open the Global Configuration section. Select a new group from all of the IdM groups in the Fallback primary group drop-down list. A transitive trust means that the trust path can follow a chain of domains. It is described in more detail in Section 5.1.1, “The Architecture of a Trust Relationship”. IdM has a trust with the root domain in a forest and, due to transitivity, all of its child domains and other domains from the same forest are implicitly included in that trust. IdM follows that topology as Windows users from anywhere in the forest attempt to access IdM resources. Each domain and child domain is a trust domain in the IdM trust configuration. Each domain is stored in its own entry, cn=subdomain,cn=trust_name,cn=ad,cn=trusts,dc=example,dc=com in the trusts subtree. When adding a trust with a shared secret, you need to manually retrieve topology of the AD forest. After running the ipa trust-add ad.domain --trust-secret command, validate incoming trust at AD side using forest trust properties in the AD Domains and Trusts tool. Then, run the ipa trust-fetch-domains ad.domain command. IdM will receive information about the trust, which will then be usable. Once the topology is retrieved (through automatic or manual discovery), individual domains and child domains in that topology can be enabled, disabled, or removed entirely within the IdM trust configuration. That trust domain can be re-enabled using the trustdomain-enable command. If a domain should be permanently removed from the topology, than it can be deleted from the IdM trust configuration. Removed information about the trusted domain " "prod.ad.example.com"
Deletion and other types of modification of domains associated with the IdM Kerberos realm are also taken care of automatically. If there are multiple changes to be made to the list of domains, the list itself can be modified and replaced using the --domain option. The --range-size option sets the size of the POSIX ID range IdM uses. IdM maps the RID of users and groups in a trusted AD domain to POSIX IDs. The --range-size option defines the maximum number of IDs IdM creates. AD uses a new RID for each user and group you create. If you delete a user or group, AD will not re-use the RID for future AD entries. Therefore, the range must be large enough for IdM to assign an ID to each existing AD user and group as well as the ones you create in the future. For example, if an administrator deletes 20000 of 50000 AD users and will, during the time, create 10000 new accounts, the range must be at least set to 60000. However, it is important that the range also contains enough reserves. In large environments, in which you expect that the default (200000) range size is not sufficient, set --range-size to a higher value. In the following example, the base ID is 1,200,000 and the RID is 1,000. The resulting ID number is then 1,201,000. Make sure that the manually defined ID range does not overlap with the ID range used by IdM. Accessing services or hosts in a trusted domain can require special flags for the Kerberos ticket-granting ticket (TGT). For example, if you want to log in using single sign-on to an IdM client with an Active Directory (AD) account from an AD client, the Kerberos TGT flag OK_AS_DELEGATE is required. For more information and how to set Kerberos flags, see Kerberos Flags for Services and Hosts in the Linux Domain Identity, Authentication, and Policy Guide. On IdM resources, if an Active Directory user requests a ticket for a service, then IdM forwards the request to Active Directory to retrieve the user information. Access data, associated with the Active Directory group assignments for the user, is sent back by Active Directory and embedded in the Kerberos ticket. Group information in Active Directory is stored in a list of identifiers in each Kerberos ticket for Active Directory users in a special data set called privileged access certificates or MS-PAC. The group information in the PAC has to be mapped to the Active Directory groups and then to the corresponding IdM groups to help determine access. IdM services can be configured to generate PACs for each authentication request when a user first attempts to authenticate to a domain service. The IdM server configuration defines which PAC types are generated by default for a service. The global settings can be overridden by changing the local settings on a specific service. Open the IPA Server tab. Scroll to the Service Options area. To use PAC, select the MS-PAC check box, which adds a certificate that can be used by AD services. If no check box is selected, then no PAC is added to Kerberos tickets. If you select the nfs:NONE check box, the MS-PAC record will not be added to the service tickets issued against NFS servers. You can ignore the PAD check box. This functionality is not yet available in IdM. Click the Update link at the top of the page to save the changes. The global policy sets what PAC types to use for a service if nothing is set explicitly for that service. However, the global settings can be overridden on the local service configuration. Modify an existing IPA service. Click the name of the service to edit. 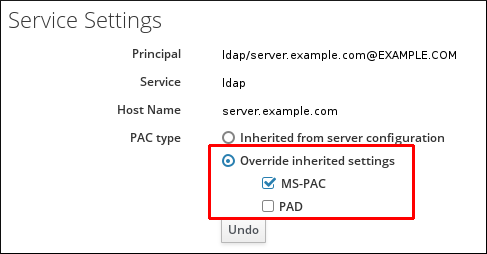 In the Service Settings area, check the Override inherited settings option and then select the MS-PAC check box to add a certificate that can be used by AD services. If no check box is selected, then no PACs are added to Kerberos tickets. If the Windows administrator manually defines POSIX UID and GID attributes for a user, create a matching group on the IdM server with the same GID for the user. Creating the group ensures that the user is associated with a primary user group. If such group does not exist, the IdM server is unable to look up all groups to which the user belongs. The client must be enrolled with an IdM server based on Red Hat Enterprise Linux 7.1 or later to benefit from this functionality. When a custom shell or home directory value is defined on the AD server using these attributes, the custom value is then displayed to the IdM client for the AD user. Therefore, the same user shell is displayed for the AD user both on the AD side and on the IdM side. If the AD administrator modifies loginShell or unixHomeDirectory on the AD side, the change is automatically reflected on the IdM side as well. If the attributes are not defined on the AD server, SSSD uses a template default value. This default value is then displayed to the IdM client. When a trust is configured, Active Directory users can access machines, services, and files on IdM hosts using SSH and their AD credentials. IdM clients do not connect to Active Directory domain controllers (DC) directly to retrieve user attributes. Instead, a client connects to an IdM server who caches this information. For this reason, if you disable a user in Active Directory, the user can still authenticate to IdM clients using SSH key authentication until the record of the user expires in the IdM database. The entry has expired automatically. The user authenticates to an IdM server using the kinit utility or the web UI. The localauth Kerberos plug-in for local authorization ensures that Kerberos principals are automatically mapped to local SSSD user names. With localauth, Windows users from a trusted AD domain are not prompted for a password when logging in using Kerberos and can therefore use SSH without passwords. The plug-in provides a reliable mapping mechanism across multiple realms and trusts: when sssd connects to the Kerberos library to map the principal to a local POSIX identity, the SSSD plug-in maps them according to the trust agreements defined in IdM. In Red Hat Enterprise Linux 7.1 and newer systems, SSSD automatically configures the localauth Kerberos plug-in. SSSD allows user names in the format user@AD.DOMAIN, ad.domain\user and AD\user. On systems with localauth, it is not required to set the auth_to_local option in the /etc/krb5.conf file or list Kerberos principals in the .k5login file. The localauth plug-in makes this previously used configuration for logins without passwords obsolete. On systems where the localauth plug-in is not present, SSH prompts for a user password for Active Directory domain users even if the user obtains a proper Kerberos ticket. To enable Active Directory users to use Kerberos for authentication in this situation, configure the auth_to_local option in the /etc/krb5.conf file or list the user Kerberos principals in the .k5login file in the home directory of the user. The following procedure describes how to configure realm mapping in the Kerberos configuration. In one rule, include a rule to map different Active Directory user name formats and the specific Active Directory domain. In the other rule, set the value of DEFAULT, for standard Unix user names. The user name must have the format ad_user@ad_domain. The domain name must be lowercase. The case of the user name must match the case of the user name in Active Directory. For example, user and User are considered different users because of the different cases. For more information about setting auth_to_local, see the krb5.conf(5) man page. The following procedure configures the system to find the Kerberos principal name for a local user name. Create the .k5login file in the user's home directory. List the Kerberos principals used by the user in the file. If the authenticating user matches the principal in an existing Kerberos ticket, the user is allowed to log in using the ticket and is not prompted for a password. Note that if you configure Kerberos authentication using the .k5login configuration, the user name used for SSH access must have the format ad_user@ad_domain. For more information about configuring the .k5login file, see the .k5login(5) man page. Either one of these configuration procedures results in AD users being able to log in using Kerberos. Any existing web application can be configured to use Kerberos authentication, which references the trusted Active Directory and IdM Kerberos realms. For the full Kerberos configuration directives, see the Configuration page for the mod_auth_kerb module. The KrbAuthRealms option gives the application location to the name of the IdM domain. This is required. The Krb5Keytab option gives the location for the IdM server keytab. This is required. The KrbServiceName option sets the Kerberos service name used for the keytab (HTTP). This is recommended. The KrbMethodK5Passwd Kerberos method option enables password-based authentication for valid users. The KrbMethodNegotiate option enables single sign-on (SSO) if a valid Kerberos ticket is available. These options are recommended for ease of use for many users. The KrbLocalUserMapping option enables normal web logins (which are usually the UID or common name of the account) to be mapped to the fully-qualified user name (which has a format of user@REALM.COM). This option is strongly recommended. Without the domain name/login name mapping, the web login appears to be a different user account than the domain user. This means that users cannot see their expected data. For information on supported user name formats, see Section 5.2.1.7, “Supported User Name Formats”.